F/X Aire™ is simply the finest, smoothest, most trouble free, alcohol-based HD Airbrush make-up formulation available today! If you have to crank your airbrush pressure up to 25psi just to get your paint to go through your gun, you're using the wrong product! 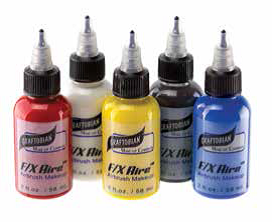 Graftobian F/X Aire™ requires only 6-8 psi to spray on smoothly and beautifully without flaw. F/X Aire™ is the best soap and water washable airbrush makeup on the market today!! Our super durable formula, available in 62 shades, is ideal for face and body artistry that needs to last 12-14 hours. When the day is done, F/X Aire™ can be removed easily with soap, water, and washcloth.